In the camel family, alpacas are a South American native. They are an ideal animal to keep on a lifestyle property or small block. Alpacas are intelligent, easy to manage and have a light environmental footprint. New Zealand has approximately 20,000 registered alpacas. They are easily trained, can be handled by someone of small stature, are hardy and relatively resistant to diseases that commonly afflict other domesticated animals. An alpaca’s gestation period is 11 to 12 months. Cria, the name for a baby alpaca, are normally born without assistance between 10am and 4pm on warm, fine days, and usually weighs between six and eight kilograms at birth. Alpacas are herd-oriented animals. Their psychology demands the company of other alpacas, so they are generally kept at least in pairs. 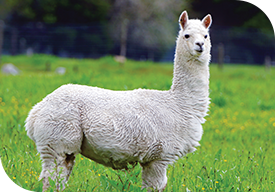 A pair of alpaca can be kept in a paddock as small as 0.2 hectares. Alpaca wethers (castrated males) are kept as pets, are available for purchase from six months old and priced from between $400 and $500 plus GST. When halter-trained, they are easy to handle. Alpacas have been valued for their soft, luxurious fleeces for generations. Their fibre is softer than wool and reckoned to be warmer and stronger, due to their native habitat high in the Andes of South America. An alpaca will produce between two and five kilograms of fibre each year. There are two different types of alpacas, the suri, which has a distinctive fleece that grows parallel to the body in long, silky ringlet-like locks, and the more numerous huacaya, which has a thick, dense fleece, growing vertically from the body, giving it a soft, woolly appearance.